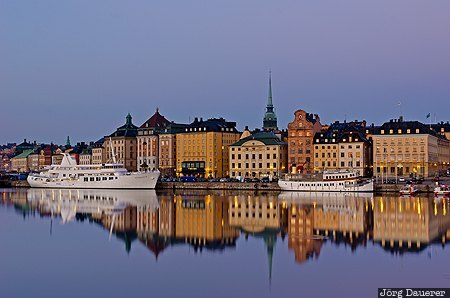 The houses of Stockholms Gamla Stan (Old Town) at Skeppsbron quay and some boats at the blue hour before sunrise and their reflexion in the calm water seen from Skeppsholmsbron (Skeppsholm Bridge). Stockholm is the capital of Sweden. This photo was taken in the morning of a sunny day in September of 2014. This photo is part of the exhibition Reflexions (February 2015). This photo is in the Photo Calendar "Südschweden". This photo was taken with a digital camera.